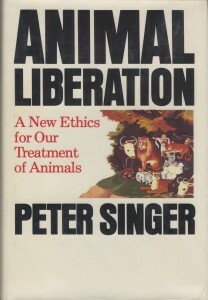 This is the cover of the first edition of Animal Liberation by Peter Singer published by New York Review Book in 1975. In 1975 Peter Singer published Animal Liberation, which became one of the impulses for the contemporary animal rights movement. Singer is a utilitarian philosopher and the moral philosophy he espouses in Animal Liberation is based upon the recognition of sentience in nonhuman animals and the consequent necessity that their interests ought to be included in any decision making. It was not until 1983 and the publication of The Case for Animal Rights by Tom Regan that we had a comprehensive and thorough account for moral rights for nonhuman animals. Utilitarianism and the natural rights view, along with ecofeminsim, have become the three traditions in Animal Ethics. return to the link between the animal liberation movement and the theories of Peter Singer who, rightly or wrongly, is seen as its founding father. How was Singer’s animal ethics greeted after the publication of Animal Liberation? What feedback did it get from the animal rights movement? What are the conceptual and practical developments of contemporary animal liberation? What place does the utilitarian doctrine and its consequentialist basis occupy in the work of Singer and in the discussion it generated? What are the approaches in animal ethics to which Singer’s publication led? The keynote speakers were Peter Singer and philosophers Lori Gruen, Jean-Yves Goffi, and Tatjana Visak. The presentations were roughly divided between French and English. I couldn’t understand the former. My French is limited to ordering coffee or beer. I also had trouble with the latter. I’m self-taught in philosophy and unfamiliar with some of the ideas and issues discussed–even when they were in English! Nonetheless, I appreciated listening to Peter Singer’s assessment of the impact of Animal Liberation forty years on and Lori Gruen’s description of entangled empathy as an alternative animal ethic. 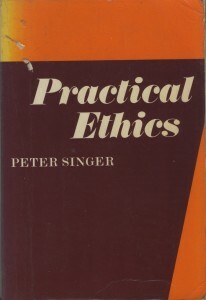 Here’s the cover of my much-read copy of Practical Ethics by Peter Singer. It still contains as a book mark the receipt from Foyles book shop when I bought it on March 3, 1981 for £2.95. 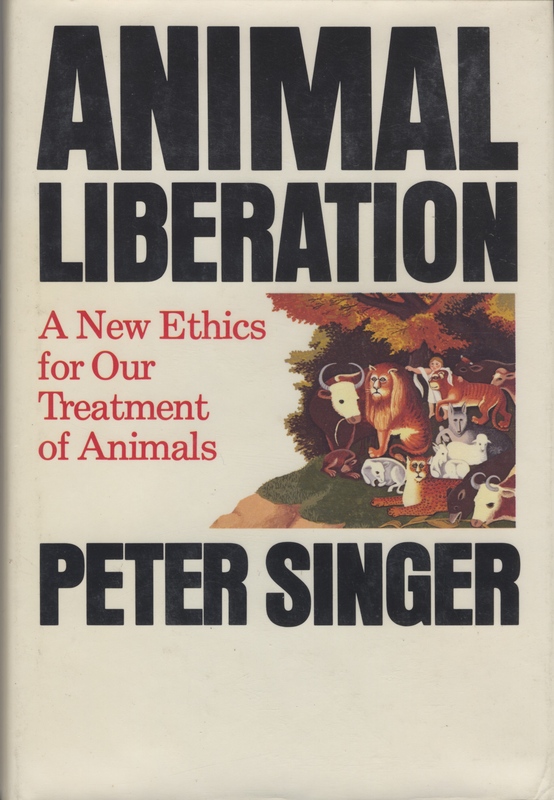 I recalled my working with Peter Singer since the 1970s and 1980s and how reading Animal Liberation and Practical Ethics had been influential in my understanding of animal rights. I recommend Practical Ethics as an overview of Peter’s philosophy as it relates to such issues as abortion and euthanasia. Subsequent revised editions have been published. I described how my thinking in animal ethics has evolved from reading and hearing speak Singer, Regan and such ecofeminists as Carol Adams, Marti Kheel, and Lori Gruen. In short, when I speak about animal rights as a matter for the law I draw from Regan’s natural rights view but my heart is more with ecofeminism. I turn to utilitarianism to help inform my everyday decision making. Speaking at this conference was an opportunity to recognise Peter Singer as more than just the author of Animal Liberation. While I made it clear that I don’t always agree with everything that he says and writes, for example, I don’t identify as a utilitarian, I recognise Peter as a philosopher whose influence is significant. Particularly I admire how he addresses such issues as environmental protection, climate, poverty, world hunger, and the effectiveness of charities while situating animal liberation as part of these issues which, in turn, is part of a larger, progressive agenda of social change.